I hated to go home without climbing to the top of a mountain, even a small one, so I decided to take a short hike up to the top of 2340-ft Bald Mtn at the north end of Franconia Notch. 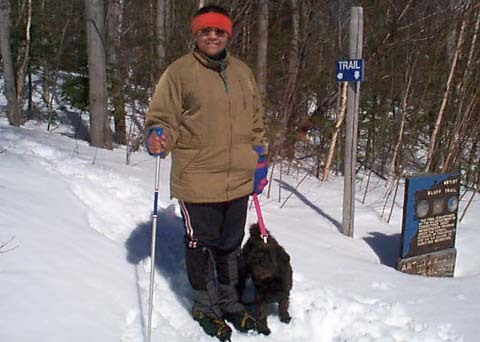 After stopping at a general store for a bottle of soda and a snack, and driving through Twin Mountain and past the North Twin, Gale River, Garfield, and Skookumchuck trailheads, we parked in the lot on the north side of the Cannon Mountain Ski Area, and walked across the road to the trailhead. Unfortunately, as I would find out later, I made the mistake of putting the car key in my pocket instead of its usual safe spot inside my wallet. This is not a demanding trail, although one short section up some rocky outcrops required a little care as the rocks were covered with slick ice due to recent melting and refreezing. On the way up, we bypassed Artist’s Bluff and headed directly for Bald Mtn first. After going through a short flat area, the trail climbed steeply up the summit cone, and we soon were there. On the way back down, we took the short side trail to Artist’s Bluff. This is an exposed ledge with views to the south and east. The ledges were a bit icy, so we had to be careful not to slip and fall all the way down to the notch. The trouble started after we got back down to the car. We were ready to hit the road, stop for some lunch, and get home before the weather got bad. But when I reached into my pocket for the car key, it wasn’t there. At first, I figured I might have put it in another pocket, so I searched through all the pockets in my coat, then all the pockets in my fleece and my pants, and then through the entire backpack, twice. Usually, when I hike, I take the car key off the key ring and put it in my wallet, then leave the rest of the keys under the car seat so I don’t have to carry any extra weight or bulk. Unfortunately, this time I just stuck the key in my zippered jacket pocket, or at least that’s what I thought I did. The ignition lock hadn’t been working right for some time, and I could use any key, or even a screwdriver to start the engine, so I knew that if I could get a door open, I’d be able to drive away. I stopped a car on its way out and asked if they might have a wire coat hanger that I could use to fish through the edge of the door and open the lock. They didn’t. Then I stopped another, and another. No one had a coat hanger. Finally, I found the next best thing, and broke off the antenna from the top of the car and bent it into a suitable shape. It wasn’t quite as stiff as a coat hanger, so every time I just about had it, it would slip off the edge of the door lock and I’d have to start all over again. Of course, while all of this was going on, Muffin had started to wander around the parking lot and I had to keep calling her back so she wouldn’t get run over. Finally, I wedged the tip of one of my ski poles behind the edge of the door to pry it open a little further and make it easier for me to move the antenna wire around, and after several more tries, the lock popped up and I was in. As predicted, one of the other keys started the car, and we were off. 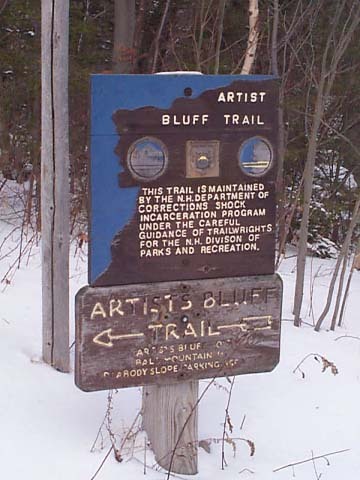 The Bald Mtn-Artist’s Bluff Path trailhead. This short trail makes a loop over the open ledge known as Artist’s Bluff and the nearby summit of Bald Mtn. 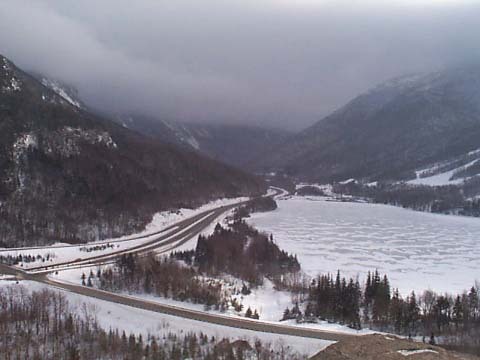 Both spots are known for their great views of Franconia Notch. Christmas tree. 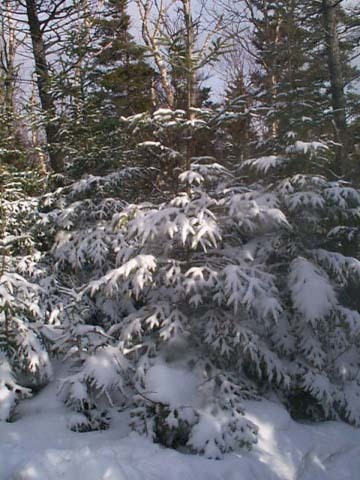 Given the time of year, this snow-laden balsam fir looked like it was all ready for Christmas. 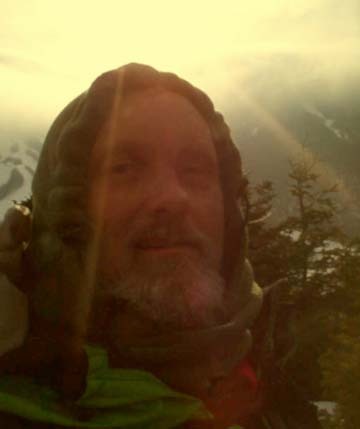 Me on the summit of Bald Mtn. Cannon Ski Area and the cloud-shrouded top of Cannon Mtn are behind me. The north slopes of the Cannon Mtn Ski Area from Bald Mtn. 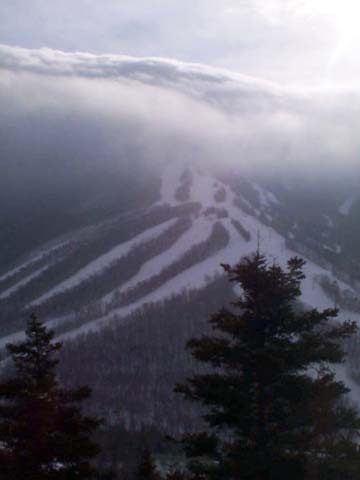 The strange cloud cover was caused by snowmaking on the mountain. Franconia Notch from Artist’s Bluff. For minimal effort, you can get wonderful views from this spot, particularly on a nice day when both Cannon Mtn and the Franconia Range are visible.